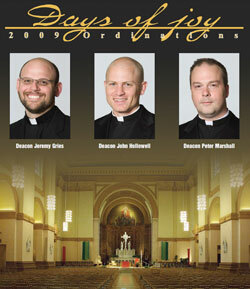 June 6 and June 27 will be days of joy for Catholics in the Archdiocese of Indianapolis as five men will be ordained priests to minister in central and southern Indiana. Archbishop Daniel M. Buechlein will ordain transitional deacons Jeremy Gries, John Hollowell and Peter Marshall on June 6. On June 27, he will ordain transitional deacons Sean Danda and Christopher Wadelton. Each ordination liturgy will take place at 10 a.m. at SS. Peter and Paul Cathedral in Indianapolis. It will be the largest priesthood ordination class for the archdiocese since 2002, when eight men were ordained priests. Profiles of deacons Danda and Wadelton will be published in the June 26 issue of The Criterion.